I recently had the privilege of working with 16 teen counselors for our 4-H regional camp. These youth applied for, were selected, and then trained to deliver high-quality youth programming and nurture younger campers. Their training introduced them to social emotional learning, specifically The Power of Empathy. They learned the difference between empathy and sympathy, and how to show genuine empathy toward campers. The one-week camp was great, but the really amazing part was what happened after the campers had gone home. The teen counselors stayed one more night to clean up and reflect. What came through were the SEL skills that the counselors had gained. Our camp is located at the bottom of a geographical bowl, with no cell phone service or internet. This lack of connectivity clearly enhances the focus of staff, counselors, and campers. 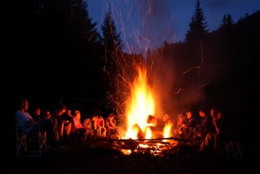 Instead of posting selfies and tweeting, counselors engaged in deeply personal reflection around a campfire every night. After camp was over, we, the staff members, revealed to the youth counselors that we sometimes go to the top of the hill for internet connectivity to check e-mail and return voice messages during the week. “Going to the top of the hill” soon became a metaphor for all of us – one which contrasted our safe environment at camp versus the real world, where things can be quite different. One of the training activities that we did was an adapted version of the mask-making activity from our center’s SEL Toolkit. Counselors spoke of the masks they created at the training that represented how others perceived them, compared to the feelings, issues and personalities they wore on the inside. Many of the teens admitted that at camp, they could be whoever they wanted to be, while back at the “top of the hill,” they were either typecast, couldn’t show their true selves, or didn’t realize who they truly were. Some were afraid to go back to their previous lives – the ones they had lived only a week before -- because they didn't want to forget who and how they were while at camp. In 2007, Durlak and Weissberg reported that high-quality out-of-school-time (OST) programs can significantly increase youths' self-esteem, self-image and positive identity. This early, foundational article on social-emotional learning, makes it evident that OST programs can provide the learning environment to teach social-emotional skills that youth can apply back into their academics. As youth workers, we need to create the rich learning environment in which these SEL skills can be safely tested. Youth workers must be capable in facilitative and reflection practices to enhance the learning that comes from these experiences. What powerful self-realizations these young people made in naming and implementing SEL skills and activities! It all happened in just a one-week intensive youth leadership experience and pre-camp training. Social-emotional learning is an essential piece of youth development and should be incorporated into all youth trainings. Hi Nicole, Thanks for sharing this post. Serving in a youth leadership like this can truly be a life changing experience. I fondly remember my leadership activities as a young person and believe they helped me become who I am today. I love the "masks" that you talked about with youth. Being reflective about how we change in different environments is so good for learning how to navigate the world. Do you think these reflections help youth to think more about who they aspire to be? I do! True reflection asks the questions that allow youth to apply any learning to real life. Add to that a safe place for them to see where they need to improve in their lives, careers, or relationships and you have a powerful experience! Thank you for sharing this powerful example of the deep impacts effective youth leadership experiences can have at strengthening identity and self concept. I like that you speak about camp as a place where SEL skills can be tested. When the camp experience is at its best it creates that safety that allows youth to test out parts of their identities that are more difficult to test at home. What type of training recommendations to you have for creating that sense of safety among counselors? Besides the SEL training, the Quality Matters course teaches about creating that positive learning environment. Team building, creating group norms, and being genuine, caring adults also aid in setting up the safety. I have also created several presentations surrounding Reflection that dives deeper into creating safe spaces for youth to explore their self-identity.